Utilising the best of breed software in conjunction with the right expertise, is absolutely vital to ensuring a highly effective, professional and successful Business Process Modelling project. QPR ProcessDesigner is the very best software system for streamlining operations in order to reduce costs, improve productivity, enhance customer satisfaction, manage risks or ensure regulatory compliance. Whist an extremely powerful and capable tool, QPR ProcessDesigner is very easy to use. Using the QPR portal, users can gain access to all of their process models with one click. By utilising the QPR Portal, users have the ability to create action or risk plans which form part of the business modelling review process. 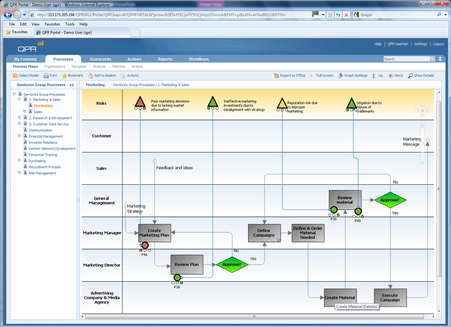 Those organisation which have QPR ProcessDesigner and QPR Metrics have the additional capability of linking their process maps to their performance models. This allows users to view the process and the associated performance indicator at the same time. 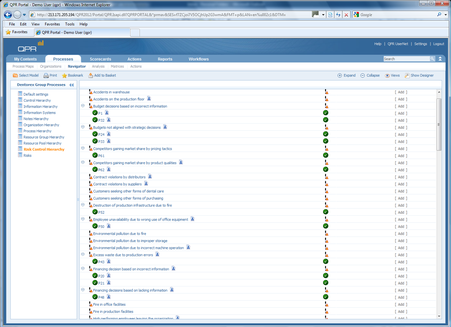 Having the ability to view processes, gauge their performance and raise and manage the necessary actions in order to address any issues, gives QPR users total performance management. QPR has been given a Positive rating in Gartner's MarketScope for Enterprise Business Process Analysis (Nov 13), no other vendor scored higher. For more information on QPR ProcessDesigner, please visit our papers / fact sheets download page.